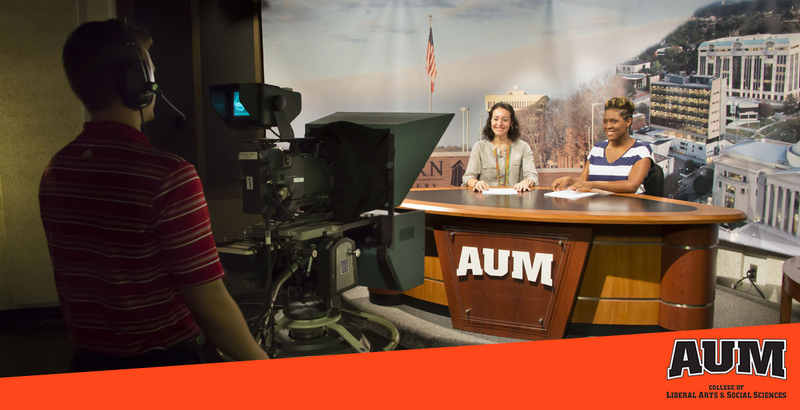 Whether you want to be a broadcast or multimedia journalist, public relations specialist, videographer, documentary producer, writer or editor, AUM’s Communication degree will provide you with the theoretical knowledge and practical training you need. The skills you’ll develop in verbal and written communication will also equip you for a variety of careers outside of the media such as those in government and non-profit agencies. Journalism students can intern at the WSFA, Montgomery Advertiser, WAKA, RSVP Montgomery magazine, and WCOV. Public Relations students can intern in local organizations such as the Southern Poverty Law Center, Raycom Media, and Baptist Hospital, among others. Jobs in media and communications are projected to grow by 4 percent from 2014 to 2024, which means that some 27,4000 new jobs will be created. This growth will be fueled by the demand for information and the need to generate, edit, and disseminate it through television, radio, the internet, and traditional publishing. The most recent median annual wage for media and communications occupations was $52,370 — higher than the median annual wage for all occupations. Buffy Lockette is the Director of Public Relations at Jacksonville State University. Darrell Puckett is a sports reporter at WAKA. Anna O-Neal is Assistant Director of communications at First United Methodist Church of Montgomery. Media and Culture: A critical examination of the purposes, functions and effects of the mass media on individuals, institutions, culture and social structure. Media Writing I: An introduction to basic writing skills in the mass media. Media Writing II: Introduction to print and electronic information gathering. Writing and editing practice. Media Law and Ethics: Origins and background of laws governing the mass media; consideration of ethical problems of the media. Media Research Methods: Stresses familiarity with journals in the field; examines methods of research in communication. Intended to increase student understanding of research literature, including experimental design, subject of selection, instrumentation, rules of inference and theory testing. Public Relations I: Principles and practice of publicity and public relations programs and planning. Case studies. Writing for Public Relations: Forms and styles of public relations writing, stressing essential skills of written communication needed in public relations. Public Relations II: Case study work on public relations problems for the university and the community.